Welcome to my video course “250 Dutch Proverbs”. I made a selection of proverbs and sayings that anyone who learns Dutch should know. The course consists of 25 lessons. In each lesson, I explain the meaning of 10 proverbs or sayings. Subtitles are available for each lesson. You just push the CC button in YouTube. The transcript of the lesson you find on Learndutch.org. And here you the drawing of today of Kata from Hungary. It represents 1 of the 10 proverbs of this video. By the end of the lesson, I show you the drawing again. Your task to guess which proverb it is. Let’s start with lesson 14, containing proverbs 131-140. Literally: it is impossible to know how a cow catches a hare. You use this expression in a situation where you don’t have a solution for a certain problem, and it is quite unlikely to solve it. Nevertheless, it may be solved in some way. You never know. Literally: to miss the plank when you wanted to hit it. You use this expression when you do or say something totally wrong. It can be used when someone takes part in a discussion and clearly doesn’t know where he is talking about, or says something as a result of a clear blackout. You can also use it when you say something, which is taken very offensive, and you did not think about that in advance. Literally: when little dot meets little pole. The meaning is to identify the moment that action should be undertaken. It is used in a situation when people talk a lot about their plans, but retreat on the moment when the plans have to be put into action. You can also use it when people talk about what others should do, but they themselves do not act accordingly. Literally: from the rain into the drop. The meaning is that you get from one bad situation into another, which is even worse. It’s difficult to have a literal translation. “Rep” means commotion. But it’s not a frequently used word. And here “roer” comes from “roeren” what in this proverb could be translated as agitate. We use the expression when there is a lot of commotion, especially when something has to be organised on the last moment. For example, a football club wins the cup, and the city administration is “in rep en roer” to organise the celebration. Another proverbs with the word “roer”, but in this expression the word refers to the helm (the ship’s steering mechanism). So the literal translation is to turn around the ship’s wheel. You use this expression when you are going to do things totally different; a different way of working or a different strategy. Often the expression is used when there comes a new manager on the job, who decides to work completely different than his predecessor. Literally: to throw soot into the food. The expression is used when someone or something spoils a nice situation. For example, you are going to have a barbecue, but then: het weer gooide roet in het eten. The weather spoiled it. By the way, the expression is not necessarily used in combination with food. For example, you could also say it when the rain spoiled your canal cruise. Literally: to have his sheep on the dry land. We use this expression to say that someone has earned enough money to live comfortably for the rest of his life. But you can also use it to stress someone has managed things well, and as a result he’s now in a comfortable situation. Again, this is an expression with its origin on the countryside. In Holland there are pieces of land that sometimes get under water. Because of the high tide, or because the flooding of the land between the first and second dam of a river (the water meadow). If you have directed back your sheep to the higher parts in time, then you are in a comfortable situation. You have secured your savings. Literally: to ride a curved skate. And yes, as an ice-skating nation we of course could not without ice-skating proverbs. You can’t go straight when your skate is curved. So you go off the right trail. The meaning of this proverb is to make a mistake, but it has a moral blame in it. For example, if someone has cheated on his wife, you can say: hij heeft een scheve schaats gereden. Literally: those who don’t want to listen should suffer. Here the word “voelen”, which means “to feel”, is not positive. So “voelen” can be translated as “to suffer” when it is in combination with a punishment (which is meant here). For example parents can use the expression to manage their children. So it is a thread for punishment in the literal meaning. You can also use it when someone is not listening to your advice: to state he then will have to face the consequences. Here you see the drawing again. One of the proverbs of this lesson. I hope you understand which proverb is represented here. Don’t quit the course – I would consider that riding a curved skate. Continue till the end, and by doing so, you will have your sheep on the dry land! Do not forget to share this video on social media, and to put thumbs up in YouTube. 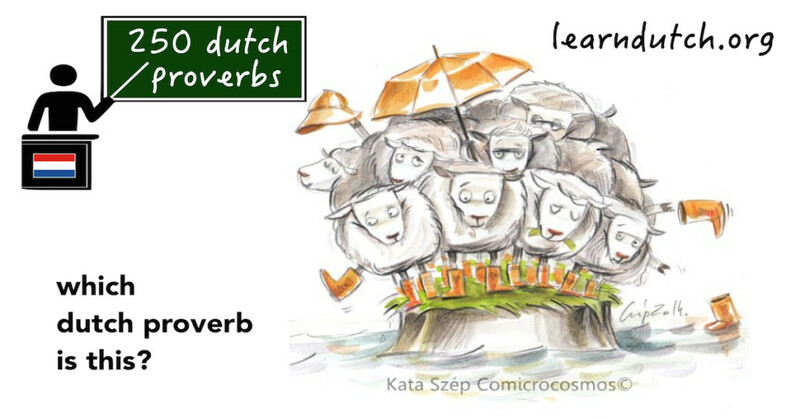 See you back in lesson 15 of 250 Dutch Proverbs.